"No Man Is An IslanD (But No Island Is A Man So It Works Out)"
Nightcrawler battles the Son of Krakoa. Returning from a vacation, Nightcrawler is forced to abandoned his damaged airplane in the midst of a huge storm and teleport to a nearby island, where he discovers giant stone monuments to himself and his former X-Men teammates. The next morning, he observes some island natives preparing a woman for sacrifice. After he intervenes to save her, he is brought before the Son of Krakoa, an alien spore released after the X-Men sent his father flying off into space, who requires the occasional human sacrifice to build his strength. Declaring himself Vega-Superior, the spore attacks Nightcrawler via simulacrums of his former teammates composed of material from the island. 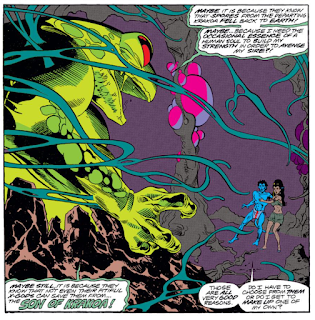 But Nightcrawler is able to defeat these Vega-Men, then tricks the spore into following him into the ocean, where he dies just like the rest of Krakoa's offspring did. 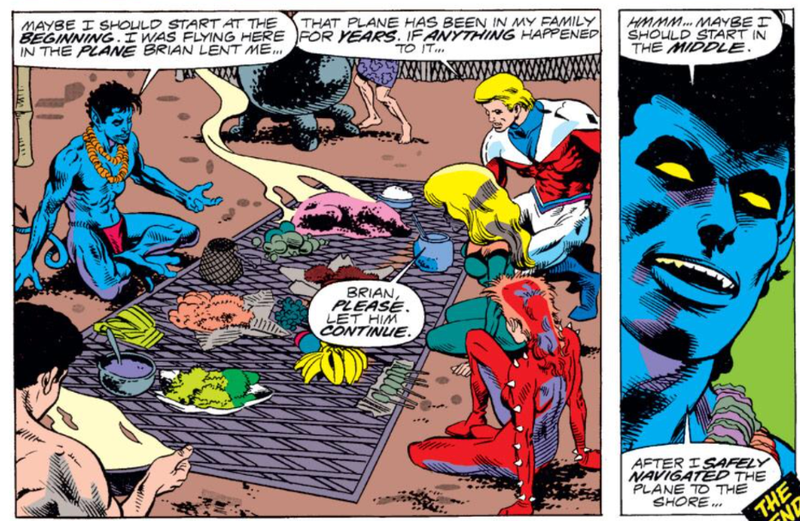 Sometime later, the rest of Excalibur arrives to retrieve Nightcrawler, who dodges questions about what happened to Captain Britain's crashed plane. This issue features the first appearance of Vega-Superior, Son of Krakoa, the living island (aka the Island That Walks Like A Man) which captured the original X-Men in Giant-Size X-Men #1 and led to the creation of the All New X-Men. Vega-Superior is a spore launched by Krakoa after it was sent into space by the X-Men, and he is the only one of all the spores released by Krakoa to survive (as he ended up on land, as opposed to water). 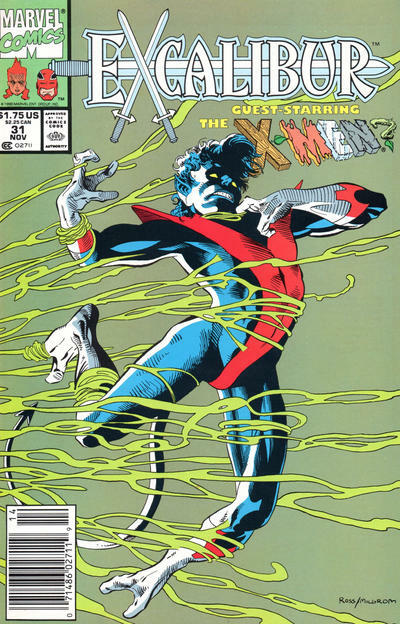 He dies in this issue when Nightcrawler tricks him into running into the ocean, where he drowns. Another fill-in, this issue is written by Scott Lobdell, who will eventually become the regular series writer on both this book and Uncanny X-Men. Art comes from Dave Ross, who filled in last issue as well. Nightcrawler mentions that he's in the midst of pushing his "one teleport a day" limit, in effect since the injuries he suffered during "Mutant Massacre", and in fact does manage to teleport several times in the course of this issue. 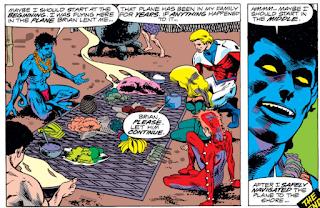 In a relatively amusing bit, Nightcrawler begins to tell his teammates about his experience, beginning with the crashing of his plane, but when Brian mentions the plane was something of a family heirloom, Nightcrawler quickly jumps ahead past the crash. As fill-ins go, especially of this vintage in this series, this isn't half-bad. Bringing back Krakoa (sort of), the villain which was instrumental in the creation of the "All New, All Different" X-Men arguably deserves a better platform than a one-off issue of Excalibur, but the whole thing is mostly played for laughs (and Krakoa, despite its historical significance, was barely more than a joke initially anyways) which makes returning to the character in these circumstances less egregious. This whole story is mostly played for laughs, in fact, and while Nightcrawler comes across as a bit too schticky at times, he's the right character for a lighter tone that mostly works, and Dave Ross, carrying over from the previous issue, proves a far more capable artist than Chris Wozniak and would, frankly, make a decent regular artist for the book at this point (though Al Milgrom is on inks, doing his best to ugly up Ross' pencils as much as possible). This isn't groundbreaking stuff and has little impact on the characters (I'm curious to see if the whole "Nightcrawler's teleportation frequency is increasing" thing gets picked up in immediate future issues), but it does have some fun with a long-overlooked bit of X-History and is genuinely entertaining, which is more than can be said for most Excalibur issues of late. Tomorrow, Wolverine rises from the dead in Wolverine #33. 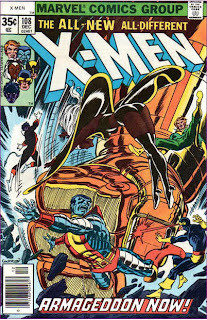 Next week, he joins the Genoshan fun in Uncanny X-Men #271, followed by New Mutants #96. Interesting. It sounds like this story may contradict the retcon that Brubaker later made to Giant Sized X-Men #1 ... ? "If Logan were alive today, he'd be spinning in his grave." I chuckled. 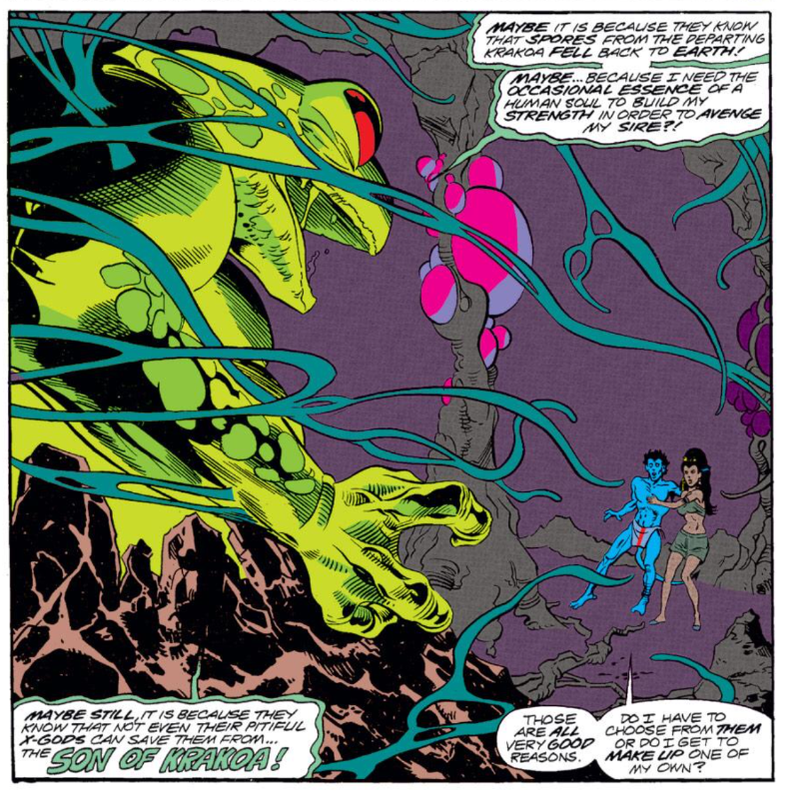 Had someone told me week ago a story exists where Nightcrawler fights a Lovecraftesque frog monster in Monkey Island type of quip melé, I would likely not have believed. 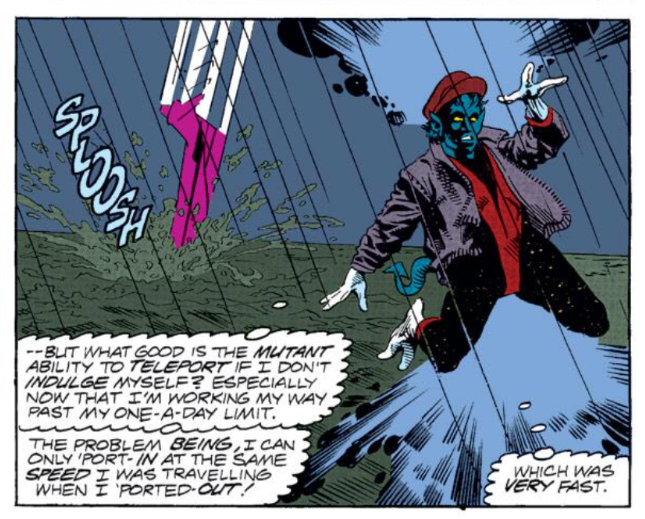 "I'm curious to see if the whole "Nightcrawler's teleportation frequency is increasing" thing gets picked up in immediate future issues"
Not sure if it is "immediate", but we do get there eventually. 10 more issues till Davis returns! Agreed. The cover was especially good, Kurt's right leg aside. Nice coloring from Brad Vancata again too. I recall not being fond of Lobdell’s X-Men work in general, early Generation X aside, but while it’s damning with seriously faint praise this is definitely the best issue yet not written by Claremont. That probably has nearly to do with not getting hung up on any of the series’ recent or current plotlines, sub- or super- or otherwise, as with the content on its own merits. It’s especially amusing in juxtaposition with this week’s issue of Wolverine. @Jason: It sounds like this story may contradict the retcon that Brubaker later made to Giant Sized X-Men #1 ... ? But in all seriousness, I don't recall enough of the details of Deadly Genesis to know whether this outright contradicts anything in it. @Teemu: Had someone told me week ago a story exists where Nightcrawler fights a Lovecraftesque frog monster in Monkey Island type of quip melé, I would likely not have believed. @wwk5d: Not sure if it is "immediate", but we do get there eventually. Yeah, I mean, I know that eventually it either gets better or gets ignored, I just wasn't sure if it continues to gradually improve over the next few issues, or just is gone the next time he has to teleport. @Blam: That probably has nearly to do with not getting hung up on any of the series’ recent or current plotlines, sub- or super- or otherwise, as with the content on its own merits. It definitely does not speak well of the series that the best issue yet really has nothing to do with Excalibur itself. "Yeah, I mean, I know that eventually it either gets better or gets ignored, I just wasn't sure if it continues to gradually improve over the next few issues, or just is gone the next time he has to teleport."